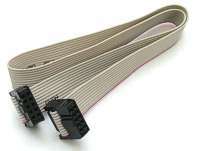 This is standard IDC 10 pin connection cable. It can connect two standard ten pin header. It can be used for in circuit programming, AVR ISP, JTAG or others.